Your quality sprung mattress need not be hard or uncomfortable. Pillow topped mattresses are a rich, luxiourious product, designed to give you all the quality of pocket sprung mattresses, with the extra comfort of layers of foam to sink into. Many customers are interested in trying one of the comfiest mattresses on the market – and of course we stock them! 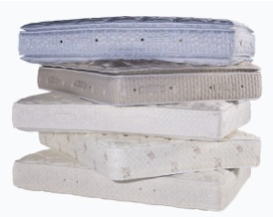 They are memory foam topped pocket sprung mattress and they’re a sure fire way to a perfect night’s sleep. We were asked recently could we make a 4 foot bed?! Well, the answer was yes, of course we can. Then I was asked why we weren’t promoting the fact since off standard beds are so hard to get! Hence this article to get the message out there! In the last blog I mentioned that traditional “sprung” mattresses are often thicker than their contemporary cousins – the memory foam mattress. And, not surprisingly, many consumers perceive this difference in thickness to reflect a difference in comfort – however not so! Many customers will ask us to explain why memory foam mattresses are almost always much thinner than the more traditional mattresses. And without doubt there is a noticeable difference in the depth when you compare both types of mattresses. So what causes the difference in thickness?